Data collected on spider predator and grasshopper prey locations in behavioral terraria. This data was collected during summer 2011. Data collected on spider predator and grasshopper prey locations in behavioral terraria. This data was collected during summer 2012. Spider predator consumption rates of grasshopper prey during behavioral observations in terraria. Includes mortality rates collected during summer 2011 and 2012. Data collected on spider predator and grasshopper prey activity as the distance moved per interval during behavioral observations. Includes data from 2011 and 2012 at 3-min and 20-min intervals. 1. Ecologists have long searched for a framework of a priori species traits to help predict predator-prey interactions in food webs. Empirical evidence has shown that predator hunting mode and predator and prey habitat domain are useful traits for explaining predator-prey interactions. Yet individual experiments have yet to replicate predator hunting mode, calling into question whether predator impacts can be attributed to hunting mode or merely species identity. 2. We tested the effects of spider predators with sit-and-wait, sit-and-pursue and active hunting modes on grasshopper habitat domain, activity and mortality in a grassland system. We replicated hunting mode by testing two spider predator species of each hunting mode on the same grasshopper prey species. We observed grasshoppers with and without each spider species in behavioral cages and measured their mortality rates, movements and habitat domains. We likewise measured the movements and habitat domains of spiders to characterize hunting modes. 3. We found that predator hunting mode explained grasshopper mortality and spider and grasshopper movement activity and habitat domain size. Sit-and-wait spider predators covered small distances over a narrow domain space and killed fewer grasshoppers than sit-and-pursue and active predators, which ranged farther distances across broader domains and killed more grasshoppers, respectively. 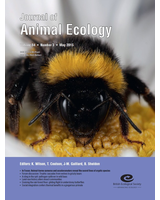 Prey adjusted their activity levels and horizontal habitat domains in response to predator presence and hunting mode: sedentary sit-and-wait predators with narrow domains caused grasshoppers to reduce activity in the same-sized domain space; more mobile sit-and-pursue predators with broader domains caused prey to reduce their activity within a contracted horizontal (but not vertical) domain space; and highly mobile active spiders led grasshoppers to increase their activity across the same domain area. All predators impacted prey activity and sit-and-pursue predators generated strong effects on domain size. 4. This study demonstrates the validity of utilizing hunting mode and habitat domain for predicting predator-prey interactions. Results also highlight the importance of accounting for flexibility in prey movement ranges as an anti-predator response rather than treating the domain as a static attribute.